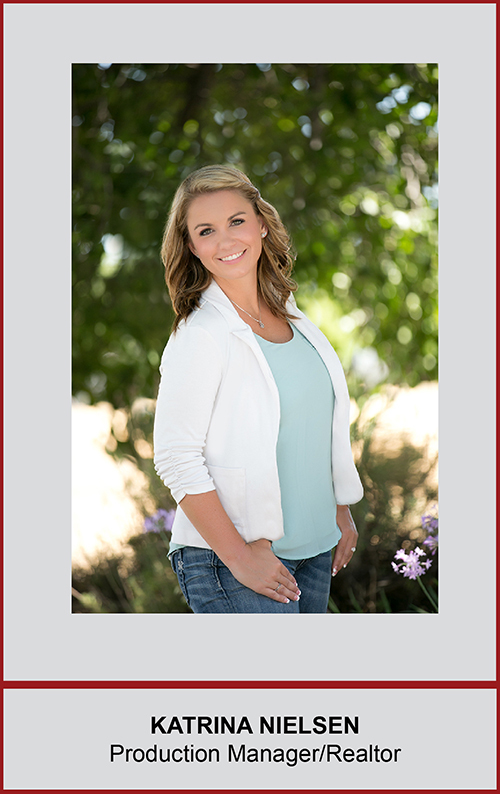 Katrina Nielsen is the production manager with the Natalie Swanson Real Estate Team. She is also a real estate professional, which gives her a deep insight into the end to end process of homeownership. Her boundless energy and customer service has led to our team success. She manages the client relationship and home inventory from the initial contact all the way through till we hand the keys to the new home buyers. Her favorite part of the job is to build a strong relationship with clients, understand their needs and help them find solutions to the many challenges during the home buying and selling process. Over the years, she has helped many home buyers navigate the path towards their dream home. Her goal is always to make the home selling process for both the sellers and the buyers as low stress as possible. With her in-depth Realtor knowledge, she is able to resolve the challenges of the home sellers and advise our B2B partners on how a home needs to be prepared, staged & marketed. She understands how demanding the process can be and provides a variety of services to navigate this critical time. She has full confidence in the process that the team has established and follows. Constant communication is one if the key elements that leads to client satisfaction. One of Katrina’s primary responsibilities is to keep our clients fully informed during the entire process. This results in a positive experience and satisfied clients. Livermore is home to Katrina and her family. She loves spending time with her 2 young children, fiancé and grandparents. They enjoy long walks together and love exploring the many hikes in the Livermore valley. She is also renovating her new home which keeps her pretty busy.